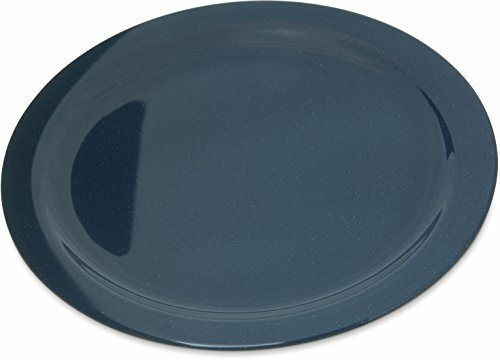 The Carlisle 4350035 Dallas Ware café-blue melamine dinner plate with reinforced rim is dishwasher safe, resistant to scratches and stains, meets National Institute of Standards and Technology (NIST) PS25-70 specifications, and is NSF listed. The melamine material resists temperatures up to 212 degrees F. The plate is designed with universal feet that enable stacking with other dinnerware brands. The overall dimensions are 10.20 x 0.84 inches (diameter x height).